Synopsis: Barcelona, 1957. It is Christmas, and Daniel Sempere and his wife, Bea, have much to celebrate. They have a beautiful new baby son named Julián, and their close friend Fermín Romero de Torres is about to be wed. But their joy is eclipsed when a mysterious stranger visits the Sempere bookshop and threatens to divulge a terrible secret that has been buried for two decades in the city’s dark past. His appearance plunges Fermín and Daniel into a dangerous adventure that will take them back to the 1940s and the early days of Franco’s dictatorship. The terrifying events of that time launch them on a search for the truth that will put into peril everything they love and ultimately transform their lives. After reading and being pulled into the drama and intrigue of The Angel's Game, (review here) and The Shadow of the Wind (review here) I was quite excited to read The Prisoner of Heaven. The story takes you into Fermin's past and Daniel's present, blending the two story lines until they meet in 1957. It wasn't as deep and mysterious as the other two books, but more of an emotional character read. It is intriguing and will engage you from page one until the very ending which leaves you with the feeling of wanting more. Even though the story can standalone I would definitely recommend reading the other two books first so you'll know what's going on. Makes me want to go back and reread the other two books now. Check out the thoughts of the rest of the participants of the tour. I have a couple treats for you. Plus download a free short story Carlos has also written called A Rose of Fire. 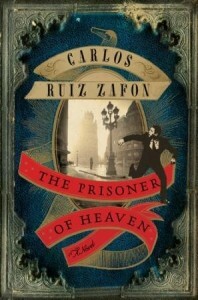 Thank you to TLC Book Tours for asking me to be part of the tour, Harper publishing for providing me with a copy of the book and Carlos Ruiz Zafon for creating such an interesting series about 1957 Barcelona and the Cemetery of Lost Books. I just finished this one, and wrote my review this afternoon. I loved it and think that it's going to be awful hard to wait for the next one! I'm glad you enjoyed this latest from Zafon, but I'm even happier to hear that your mom is doing well!! !